Mix media on 16 x 20 canvas. This painting is part of the "Evidence" series where I explore the idea of leaving evidence and clues about the mystery and process of the painting. Like a chalk line around the missing body or muddy footprints on the kitchen floor, something happened here and there are clues and evidence. This painting is wired to hang in either vertical direction. You decide which way is up. Then change your mind. 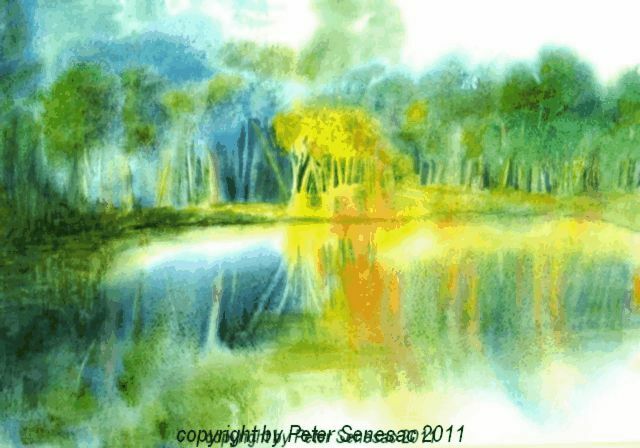 This painting captures the low angle sun shining through a grove and lighting up the trees and reflecting on the lake. One of my favorite watercolor techniques is to start with very wet paper and let the paint flow. As the paper dries, more detail is achieved by adding and lifting out paint. I can take other, close up shots of the painting and frame for those interested. Shipping large framed paintings with glass is tricky and expensive business. Local pickup or shipping without the glass is recomended Subject to prior sale of course. Please contact me for shipping opptions. 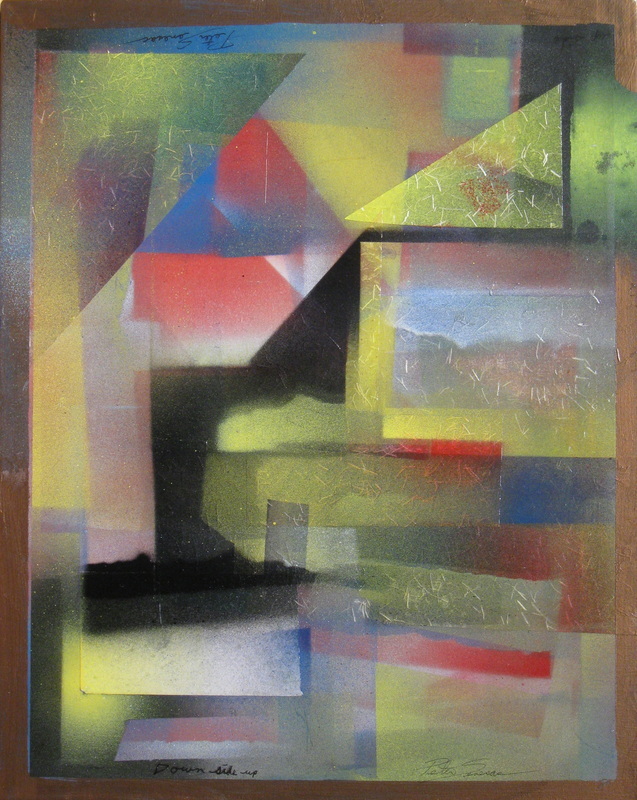 The subtle, colorful grays in this misty scene are achieved by many thin, wet layers of red, yellow, and blue transparent paint. This process creates a luminus quality that doesn't show up in photos. I can take other, close up shots of the painting and frame for those interested. Matted and framed under glass in a gold wood frame. Shipping large framed paintings with glass is tricky and expensive business. Local pickup or shipping without the glass is recomended .Subject to prior sale of course. Please contact me for shipping opptions. 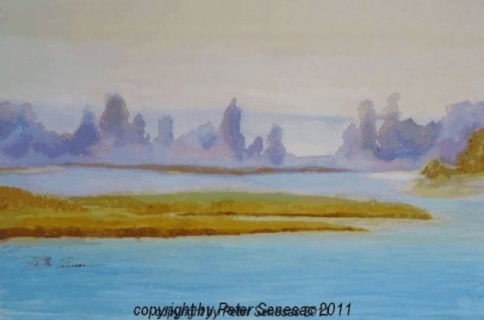 This is a slide show of current paintings still available. Some are watercolors on paper matted but not framed and some are framed. Others are watercolor and/ or acrylic on canvas or paper collaged to canvas or board. Sizes rang from 5 x 7 to 24 x 48. Contact me if you are interested in something and I'll give you a better descriptions and prices. Forms of payment include Paypal and Credit cards. Subject to prior sale.